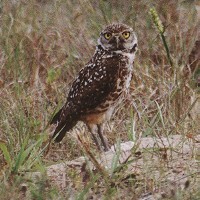 Florida Burrowing Owls are found in dry grassland habitats, including partially developed areas, in the peninsula and Keys. Cape Coral has one of the largest nesting populations in the state and holds a festival each year. Standing on the mound of sand in front of the nest. 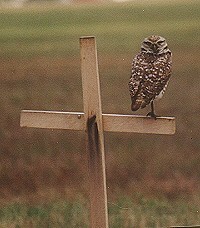 In some areas, stakes mark the burrows and provide convenient perches. 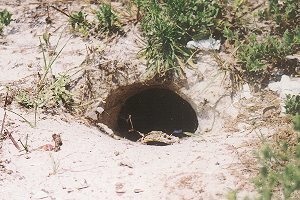 The typical burrow is almost three meters long with a curve just beyond the entrance and a nest chamber at the end. Just prior to egg-laying and during incubation, the entrance may be decorated with a variety of scavenged objects.